Don't freak out. I know, you think I must be an incredibly disturbed human being to put chili on waffles. But these aren't regular waffles. These are cornbread waffles. I mean, it's like chicken and waffles meets chili and cornbread. Or something like that. So if you're one of those people that like to dunk every bite of your cornbread into your chili, then these are the waffles for you. If you prefer your cornbread with honey, strawberry rhubarb jam, maple syrup, or all of the above, welcome to my life... where we eat chili in bowls and cornbread waffles on the side like boring people. Now, you may think I've been slacking off lately with the blogging, and that would be true. BUT... I do have an excuse. My computer crashed, you see. Luckily it's back in business now (yaaaay). Don't worry, I haven't been completely unproductive while it's been down. I've been making people cakes and taking my sister's senior pictures. Plus I've been busy informing myself on the presidential candidates of course. Okay, okay... so maybe I've just been watching the bad lip-reading video of the debate a thousand trillion times. Seriously WATCH THE VIDEO. But don't watch it at work because then you'll have to plug your nose to keep yourself from laughing and people will think you're just sitting at your desk crying like a deranged pig or something. And whatever you do.... don't click on the Twilight or Hunger Games versions. Wait until you're in the non-embarrassing confines of your own home where you can laugh your eyeballs out freely without being judged. Then, after your bazillionth view when your you start to feel a rumbly in your tumbly, go ahead and make yourself some chili and cornbread waffles. See that sneaky little bean hiding in that crevice? It's like Where's Waldo. Waldo the bean. Disregard the general clutter. I just thought the steam looked pretty sweet. I think this was a gluten-free one. Check out the recipe here. God approves of my waffles. Look at how the light shines on them from above. Cheese goes with chili, doesn't it? Who am I kidding. What doesn't go with cheese? And that's all. It's party time, chumps. Preheat waffle iron to high. Mix together the oil, eggs, and milk. In a separate bowl mix the sugar, flour, cornmeal, baking powder, and salt. Add the the egg mixture and mix until combined. Add a tablespoon a couple more tablespoons of milk if it's too thick. Cook according to waffle iron directions. Heat a little oil or butter in pot on high heat and add the onion, garlic, and celery. Cook until they begin to brown. Reduce heat to medium-high and add the meat and season generously with chili powder, paprika, garlic powder, dried oregano, and salt and pepper. Cook meat until browned and drain. Add the beans and tomatoes. Whisk together the tomato juice and corn starch or flour and add that too. Add a couple tablespoons of brown sugar and allow to simmer until thickened. 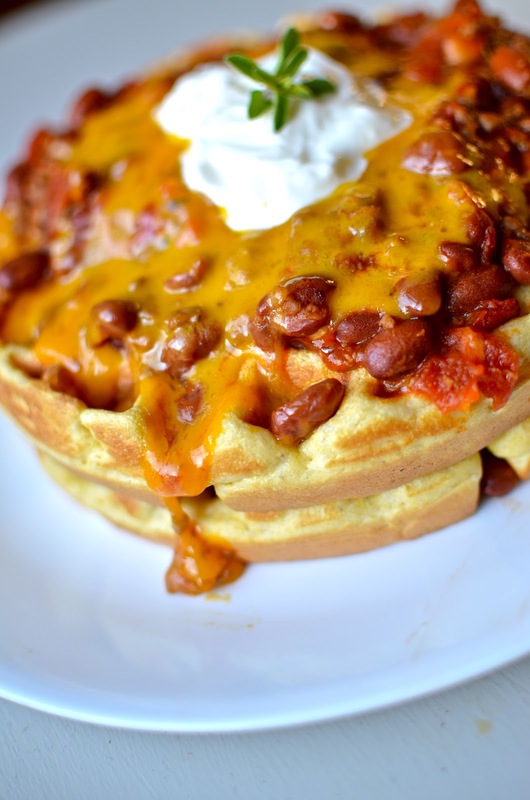 To assemble waffles, put some chili on top of them and a pile of grated cheddar cheese. Put under the broiler or in the microwave just until melted (if you use the microwave don't do it for very long or the waffles will get soggy). Top with sour cream if desired.